Bohemia Interactive's ARMA II is getting patched up later this month, with a free bonus campaign and new warfare mode included as a way of saying thanks for putting up with all of the bugs. Okay, that's not exactly what the developer is saying, but it's certainly implied. 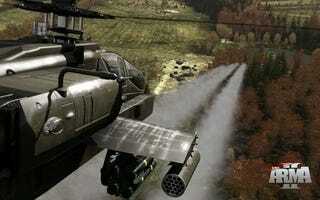 ARMA II, the sequel to ArmA: Armed Assault, released earlier this year with more than a few terrible bugs and glitches. While Bohemia has been releasing patches on a regular basis, I'd say the players still playing are definitely in line for some congratulatory downloadable content. Patch 1.05 brings that content to players, with a brand new "Eagle Wing" mini-campaign that puts players in control of the new AH-64 Apache attack helicopter on a mission behind enemy lines. The patch also ups the scale of ARMA II's warfare mode with the "When Diplomacy Fails" game type, which allows for 3 sided diplomacy across all factions. Warfare mode is a combination of real-time battles and strategy, letting players fight on the front lines or issue tactical orders as a commander. "At Bohemia Interactive we make a continuous commitment to support our products. This latest update 1.05 reaffirms our commitment to ARMAII2 and our community at large: it includes the free downloadable content as our way of saying thank you to all those who buy our games and provide us support and feedback from around the globe. We continue to be amazed by the many ways our community is constantly expanding on our game with add-ons, mods and usermade missions. With this level of continued activity surrounding our game it's our pleasure to be able to support it this extensively post-launch." said Marek Spanel, Bohemia´s CEO. Patch 1.05 will be released later this month. Congratulations, ARMA II diehards. You've earned it.